In the 1930’s, in the depth of the depression many government departments were initiated to supply employment and hope to the country. One was the Cumberland Homesteads project originally directed by the National Resettlement Administration. 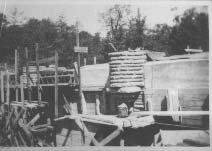 Another was the Civilian Conservation Corp (CCC) which gave employment and training to young men across the country and was directed by the National Parks Service. Also active was the Forestry Department with plans of conservation and projects to expand the State Parks systems. 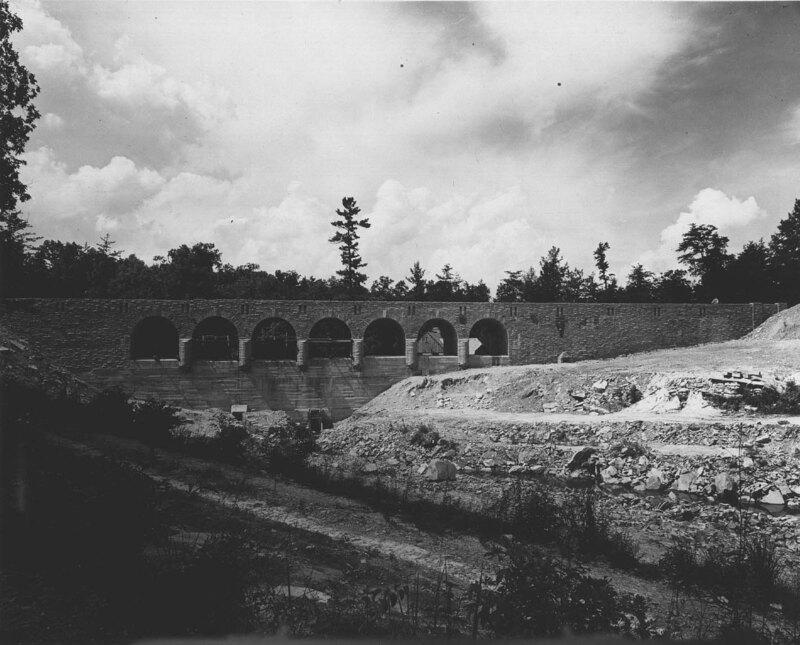 These three projects converged at the dam at Cumberland Mountain State Park. About 10,000 acreas were purchased from the Missouri Coal and Land Company by the U.S. government for the development of 250 farms in the area known as Cumberland Homesteads. About 1,500 acres were set aside in the plans for a recreation area for these families. This park was built by the CCC Company #3464, the Workers Project Administration (WPA), the American Friends Service Committee, and families in the Homestead community. Originally constructed for the local community, Cumberland Homestead Park was transferred to the Tennessee State Park system and opened to the public in 1940 as Cumberland Mountain State Park. 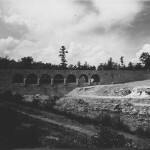 The first, main and largest structure in the park is the dam and bridge. It was started in 1934 and completed in 1938. It is the largest masonry structure built by the CCC and also considered the largest non-reinforced dam in the world. 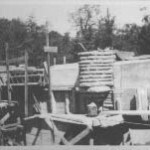 As with the rest of the Homestead community, this dam was built from all native materials. 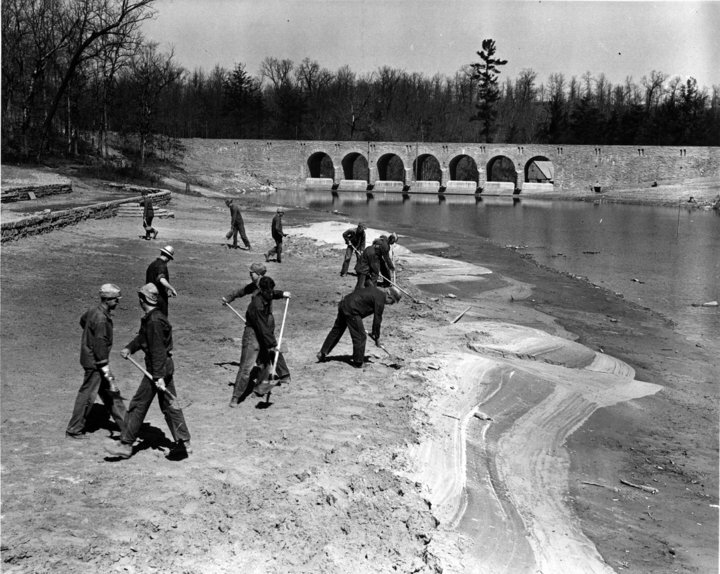 The future lake bed was cleared and the timber used to build the forms for the dam construction. Unusable timber was made into artificial fish shelters and secured on what was to become the lake bottom. Many of the plants on the new lake bed were transplanted and used in landscaping other areas of the park. Concrete which was the core of the dam was made from the local sandstone. The CCC boys crushed the sandstone into a main ingredient of concrete. This was done partly by hand (hammer) and partly by machine (a Day Swing-Hammer mill driven by motor of 1918 Piece Arrow). The dam was faced with Crab Orchard stone that the CCC quarried from the local area. It is as if the dam grew from the bedrock of the park. Today it holds back 35 acre Byrd Lake which supplies opportunities for boating and fishing. 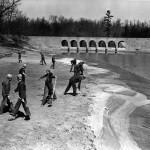 Originally, an 800 foot sand beach and swimming area bordered the lake by the restaurant. Hiking trails follow the lake shore as well as Byrd Creek both above and below the dam. Cumberland Mountain State Park, which is one of fourteen original Tennessee State Parks, is proud of its history and natural beauty.